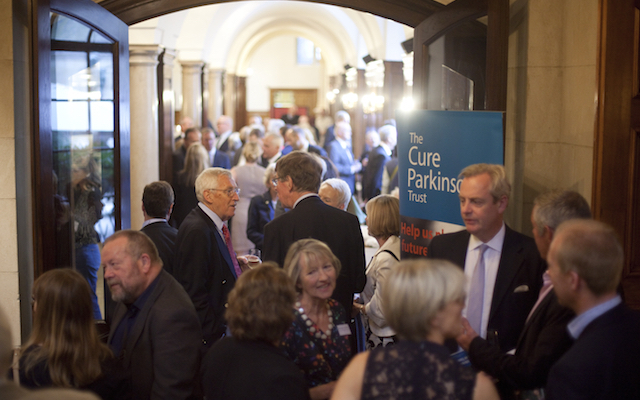 In 2005, Tom Isaacs co-founded The Cure Parkinson’s Trust (CTP), an organisation which is focused on funding research with the potential to slow, stop and reverse Parkinson’s. The CPT has since raised £6million for research. 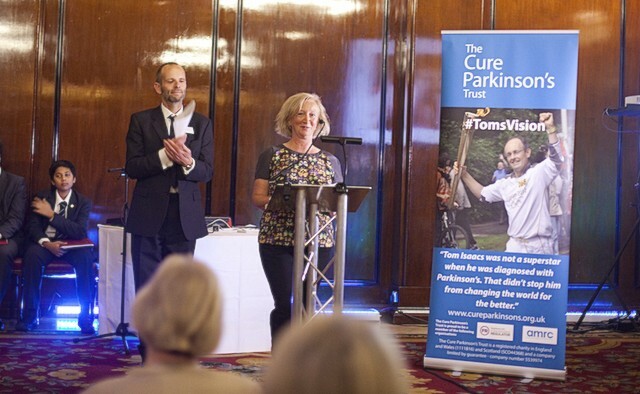 So began an event held by The Cure Parkinson’s Trust last week to celebrate the life of Tom Isaacs, the charity’s co-founder and president, who died unexpectedly on 31 May at the age of 49. Around 500 people joined Tom’s family, friends and colleagues for an evening of speeches and music at the Merchant Taylor’s Hall, London, UK. In an emotional address, Tom’s wife, Lindsay Isaacs, described her husband’s “charm, intelligence, sense of fun, empathy, quick wit and self-deprecating sense of humour”. Tom Isaacs was diagnosed with Parkinson’s disease in 1996 at the age of 27. He co-founded The Cure Parkinson’s Trust (CPT) in 2005 with the mission of finding a cure for Parkinson’s. The CPT has since raised £6million for research. Those attending the event included the former England rugby player Mike Tindall, the former Scottish rugby player Gavin Hastings and the comedian Tim Vine. The Right Reverend Richard Chartres, former Bishop of London and a friend of Tom’s, described him as having “such joy and such a gift for friendship”. He said, “Tom had extraordinary impact on the world. He achieved so much. We will be loyal to his memory in continuing to support The Cure Parkinson’s Trust and continuing to work for that cure. 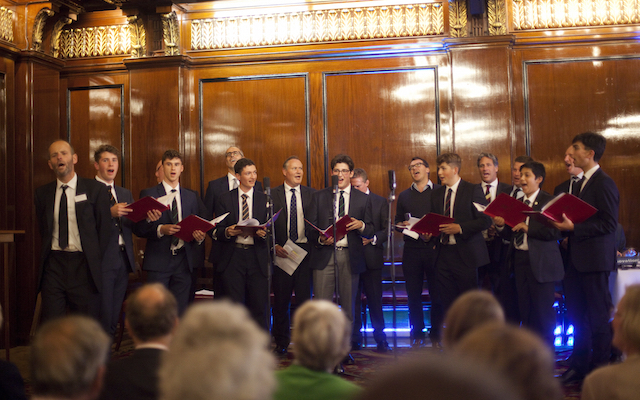 The evening was interspersed with singing from the Thomas White Singers – a group from Tom’s former school, the Merchant Taylor’s School in Middlesex, UK. Celebrating his more humorous side was a sing-along of his version of the Monty Python song ‘Always Look On The Bright Side of Life’ – renamed ‘Always Give To The Cure Parkies Trust’. Bryn Williams, the founder of Funding Neuro, told the audience: “I first spoke to Tom a year after my diagnosis. He inspired me to go bigger, to devote a part of my life to finding a cure for Parkinson’s. He inspired a generation. Hope [is] the most valuable gift there is. Tom Isaacs gave us real, genuine hope. Not just to live with the condition: Tom gave us hope of a cure. He made an indelible mark on everyone in this room. Helen Matthews, chief operating officer at the CPT, thanked Tom for “15 years of inspiration, adventure and fun”. 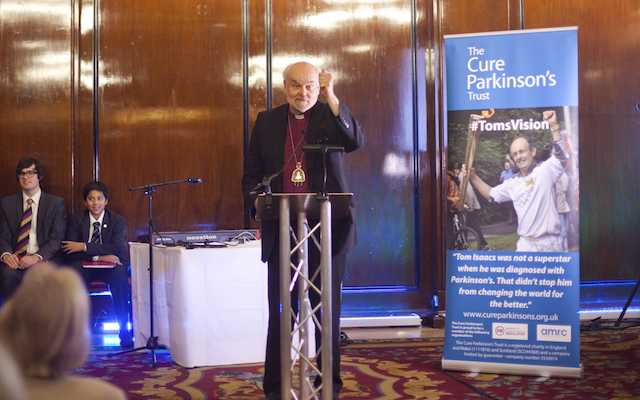 Helen said: “Tom believed a cure for Parkinson’s is possible and through CPT he is ensuring that this is tangible. [His vision was to] find ways to slow down, stop and reverse Parkinson’s ­– and involve people with Parkinson’s in that process.